Entry No. 186, Streptocarpus 'Dale's Scarlet Maccaw', exhibited by Gail Gray. Score: 96. First Place. Entry No. 451, Streptocarpus 'Raspberry Splash', exhibited by Mel Grice. Score: 93. Second Place. Entry No. 452, Streptocarpus 'Chorus Girl', exhibited by Mel Grice. Score: 92. Third Place. Entry No. 370, Streptocarpus 'Spin Art', exhibited by Richard G. Carr. Score: 87. Entry No. 377, Streptocarpus 'Greta', exhibited by Richard G. Carr. Score: 85. Entry No. 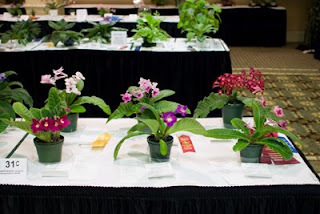 378, Streptocarpus 'Suzie', exhibited by Richard G. Carr. Score: 84.